Colin graduated from Liverpool Vet School in 1986 and, after spending a year in mixed practice he joined the practice. Having been born to a ‘horsey’ family (his parents ran Croft Riding Centre and his sister Jo is a top dressage trainer and judge) he became a keen rider, competing up to advanced level eventing. He still enjoys riding occasionally but is more likely to be seen riding his bike now, as he competes in triathlons. Colin lives at Brown Moss Farm with his wife Emma and their two young sons, Harry and Jamie and their daughter Lucy. Georgie qualified from Liverpool Vet School in 2001. She then spent a short time in a mixed practice before joining this practice. She lives with her fiancé Ed, a small animal vet, together with their dogs and cats. Many of you will have seen Seth the collie out with her on calls. Georgie spends most of her spare time riding her horse Colin (and no, she didn’t choose that name herself! 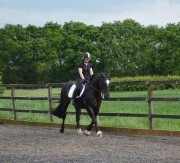 ), and has recently started eventing, having previously been a keen dressage rider. Lucy graduated from the Royal Veterinary College and joined the practice in September 2010. She comes from a farming background and has had ponies and horses from an early age. She is often to be found with her grey mare Scooby Doo!! 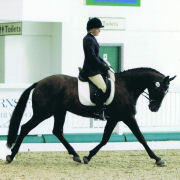 She enjoys all aspects of equestrianism, especially dressage and show jumping. Lucy is a keen hockey player and is a supporter of St Helens RLFC. Her husband Jonathan is a doctor and they have a black lab called Miley who loves joining her on calls. Rachel is the newest addition to our team having graduated from the University of Liverpool in July 2013. She has been looking after the horse population in Hertfordshire for two years, but is now returning home to Cheshire. She brings with her her chestnut cob George and her scatty collie Pepper.